The Indian economy is poised to miss the central bank’s growth forecast for the current fiscal year, while the inflation outlook is uncertain, Reserve Bank of India (RBI) governor D. Subbarao said on Thursday. The central bank’s target for inflation easing to 7% by the end of March faces uncertainty over the rupee and oil prices, he said. He was making his first extensive remarks since RBI on Friday left interest rates on hold after 13 increases since March 2010 and shifted its focus towards growth as the once-surging economy is battered on several fronts, even though headline inflation remained above 9% in November. Food inflation, a key driver of broader price pressure, has fallen dramatically in recent weeks even as manufacturing and fuel price inflation remain elevated. 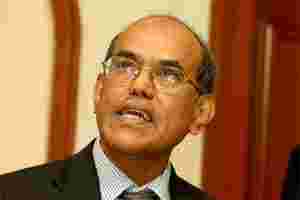 “There are risks to inflation," Subbarao said. “Oil price may not come down as much as we intend, rupee might depreciate more than what we think. We don’t know about food prices." Subbarao’s remark on Thursday about the inflation target rattled markets. The benchmark 10-year bond yield rose 3 basis points to 8.37% after his comments.